The Mother of Divine Grace homeschool program provides Catholic families a curriculum that incorporates their religious beliefs while utilizing a classical approach to education. Founder and director of the Mother of Divine Grace School, Laura Berquist, also developed the curriculum recommended by her school. The basic curriculum is outlined in her book Designing Your Own Classical Curriculum. Ms. Berquist provides homeschooling families with a solid Catholic-based classical program of education. 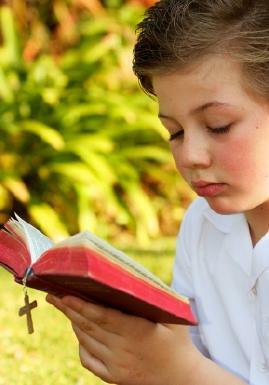 The Mother of Divine Grace School is an accredited private school program. Records are kept of each student and transcripts and diplomas are issued to graduates upon completion of their studies. A distance education program, the Mother of Divine Grace School helps homeschooling families design and implement a curriculum for each child based on their interests, needs and learning styles. In addition, the educational consultant assigned to work with each family considers the parent's teaching style, interests and resources while designing the curriculum for their child. Works with the student to understand the concepts of particular problems. The Special Services Program is supplemental to the main program. Students enrolled in this program are assigned to a special services consultant that adapts the curricula to the special needs of each student. An important aspect of the classical approach to learning is focusing on teaching a child how to learn, and teaching students how to think and reason while following the four natural stages of a child's learning development. For homeschooling families wanting an alternative to formulating their own Catholic-based curriculum, the Mother of Divine Grace homeschool program may be the perfect choice.